The phrase “a picture is worth a thousand words” must have been coined by a golfer looking at a photograph of Erin Hills. For the otherworldly images by our Chief Photographer Paul Hundley speak to the soul more than any written word could ever do. As host of the 2017 U.S. Open, Erin Hills has the distinction of being the first course in the Badger State to host the nation’s most historic major. But the potential 8,300 yard behemoth located 35 miles northwest of downtown Milwaukee, WI, has so much more to offer than one week in June three years from now. 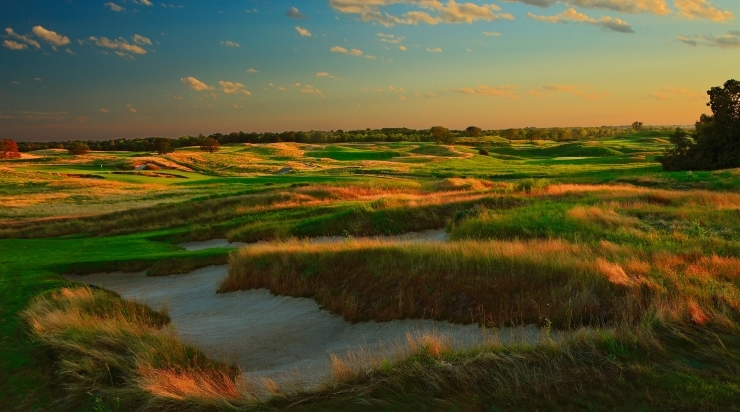 Presently, Erin Hills is a bona fide Top-10 Public Course according to Golf Digest’s prestigious 2013-14 list. Very rarely will a first-time entrant come in at such a high position, a placement that does not go unnoticed by Erin Hills’ staff. “Golf Digest’s rankings are supposed to focus on the course itself and not on the service at the course, but it is safe to say that this high ranking says an awful lot about our talented and dedicated maintenance staff,” stated John Morrissett, Competition Director at Erin Hills. “They put in so much work on the course, and they do so out of eyesight of the guests. Even the first group off will not run into the maintenance staff as they prepare the course for that day, which leads to a better experience,” concluded Morrissett.